A vital part of any Christmas table its important to get your stuffing just right. A lot of stuffings are prepared by placing them inside your turkey but seeing as it takes hours to cook a turkey you are at risk of completely overcooking your stuffing and missing out on how good it could really be. 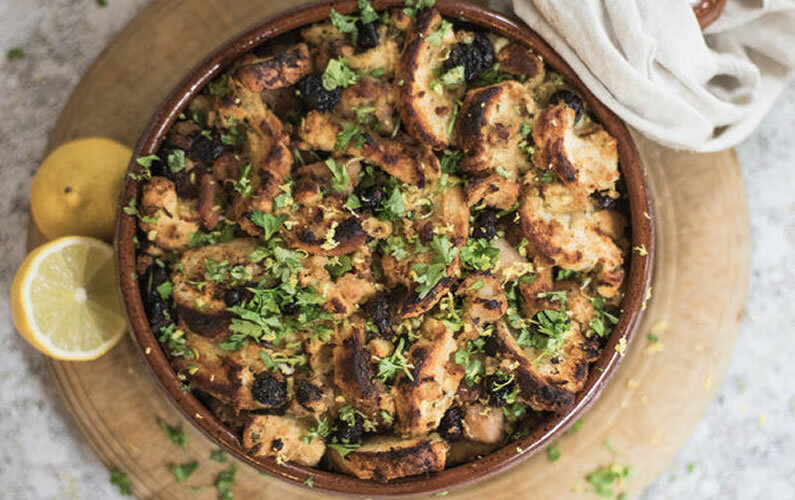 This delicious stuffing can be made a day in advance and just popped in the oven 30min before you are ready to serve. It works perfectly timing wise, once your turkey is cooked and removed from the oven allowing it to rest you can pop your stuffing in to cook so you don’t have to worry about not having enough space, as we all know how jam-packed it can get in there on Christmas day! Where possible use day-old bread, place the ripped bread onto a baking tray and into the oven for 8-10min until it dries and is lightly toasted.Put a large frying pan on to medium heat and pour in your Newgrange Gold Garden Herbs & Lemon Rapeseed Oil. Place in your onions and season with a pinch of salt, allow to sweat down slowly. Once they have become translucent add the garlic and white wine, stir and allow to reduce for 5 minutes. Add the bacon pieces and sausage meat to the pan with the onions and cook until cooked through and golden in colour. In a bowl add the lemon zest and juice, chicken stock, cranberries, egg, pepper and herbs keeping aside half of the zest and half the chopped parsley to sprinkle on top when finished. Add the remaining of the ingredients to the bowl, the sausage meat mixture and toasted bread, stir until fully combined. Pour the mixture into a baking tin * and bake in preheated oven for 25-30min. Remove and sprinkle with the remaining lemon zest and chopped parsley, serving straight away.